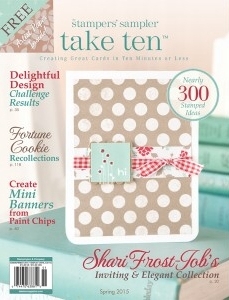 Get into the spirit of spring with the newest issue of Take Ten. You will find instructions for over 300 sweet and seasonal cards. Whether you’re looking to make cards that feature contemporary birthday cupcakes or you want to create a more understated thank you card, be sure to pick up your copy for inspiration. Learn to make stand-out party invitations as the warmer months approach or change your stamping routine with artful design layouts by taking pointers from our Design Challenge.